Armor Steel Buildings - Design professionals will appreciate the beauty and simplicity of ARMOR steel building designs. Architectural features that will be timeless and reflect beauty for years to come. 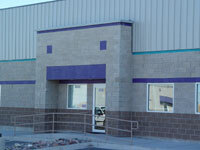 As you may already know, ARMOR Steel Buildings, Inc. is a closely owned and operated corporation. By shipping building materials factory direct through our network of authorized ARMOR Builders, our customers can realize huge savings over conventional construction. Our diverse corporation consists of subsidiaries and affiliates located throughout the United States. Armor Steel Buildings, manufacturing facilities are members of Metal Building Manufacturers Association (MBMA), IAS Certified (ICBO) and have the CSA-A660-Certification required for manufacturing Steel Buildings for the Canadian NBC Codes, as well as International Accreditation FA-446 for the International clients. Today's pre-engineered steel buildings don't need to modify your clients' needs, they need to meet or exceed them. Over the past 10-15 years, ARMOR Pre-engineered Steel Buildings have made dramatic technical improvements in product cost, construction time and aesthetic efficiency versus conventional construction. These improvements allow much more pleasing aesthetics to be added to ARMOR pre-engineered steel buildings. ARMOR can design to meet your exact size dimensions, even down to 1/8th of an inch. Interiors can be designed to accept one, two and sometimes even three stories of mezzanines. There are 4 primary areas of Value added savings that ARMOR pre-engineered Buildings offer huge savings, over other forms of conventional construction. As a result, other types of construction can rarely match the economics of a low-rise pre-engineered ARMOR Building system. Beautiful Exteriors: — Parapets, mansards and canopies can be designed and installed with walls of brick, block, glass, pre-cast concrete, tilt-up concrete, vinyl siding or even wood. ARMOR offers several different types of Stucco and esthetic exterior options that can be designed & installed without requiring the heavy foundations to support masonry and which drastically reduce the labor cost of installing masonry by almost 30-40%. Reduced Construction Cost: — the main structural and secondary framing systems of your building work together; allowing greater flexibility for code, extreme snow, seismic and wind load stability with out requiring excessive concrete foundation designs. 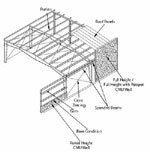 ARMOR pre-engineered buildings typically only require a Pier & grade beam type of foundation for commercial projects and can save as much as 30-50% over the traditional concrete foundations. Learn More on How to Estimate Concrete. Improved Roof Systems: — Standing Seam roof or other similar roof systems offer savings of up to 50% over the traditional Built up roofs, while offering a lifetime of use, weather tightness warranties and are much more efficient for reducing cost of maintenance, energy, and construction time, over built-up or rubber roof systems. Learn More about Standing Seam Roof Systems. Speed of Construction: — Because Armor pre-engineered building materials are fabricated and delivered to site quickly, (approx. 6-12 weeks) and since the building is designed to bolt together perfectly, it requires less time and less experienced labor; construction is fast and more cost efficient. This can allow the completion and use of the building sometimes as much as 30% ahead of schedule over other conventional types of construction, providing a much quicker return to your customers investment and reducing the total cost of ownership. 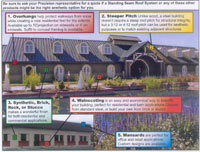 Learn More about Estimating Erecting. Warranties: — Unlike conventional construction, many design professionals take advantage of the warranties offered on Pre-engineered buildings from Armor. These include Lifetime warranties and state engineer certification on the structural design that meet almost any extreme environmental conditions that you request in your specifications for a lifetime of use. Unlike wood or other types of conventional construction, the loads on an Armor building system are not reduced or pro-rated over time. Armor Buildings have a lifetime certification for the snow, wind and seismic codes specified. Exterior steel panels come with up to a 40 year warranty on the coatings. Roof systems are available with a 20-year weather tightness warranty when installed, warranted and certified by a professional erector. Learn More about Our Wind, Snow and Coating Warranties. As with other construction methods, when concrete, masonry or other exteriors are used with an ARMOR building there may be multiple parties responsible for the structural design and attachment. The Technical and Specification documents below are intended to provide information about ARMOR Buildings systems that will assist the project designer in evaluating and requesting the proper design. Call us today request our Architect's Product Information. The package includes useful general specifications, brochures, sample drawings and other materials about steel buildings. Also our Authorized ARMOR Builders and ARMOR Project Management (PM) Team are available to answer your questions and offer assistance with your next steel building project.